Highway infrastructure usually calls to mind a bland blur of concrete - but the city of Melbourne has turned a standard freeway connection into a new and memorable art form. 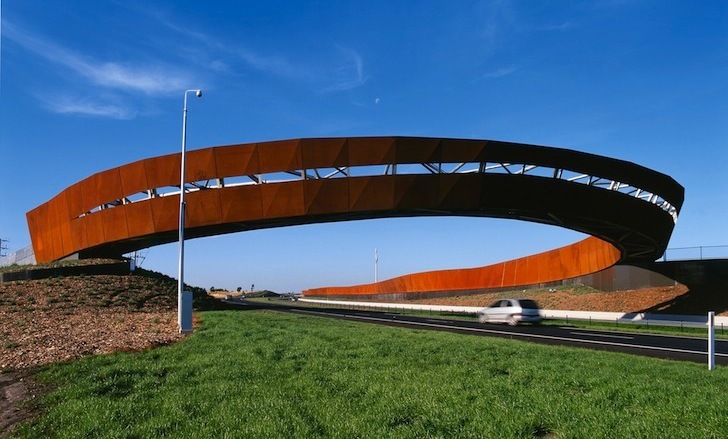 Entitled the Craigieburn Bypass, the artistic freeway sculpture was designed by architects Tonkin Zulaikha Greer in collaboration with landscape architecture firm Taylor Cullity Lethlean and artist Robert Owen. 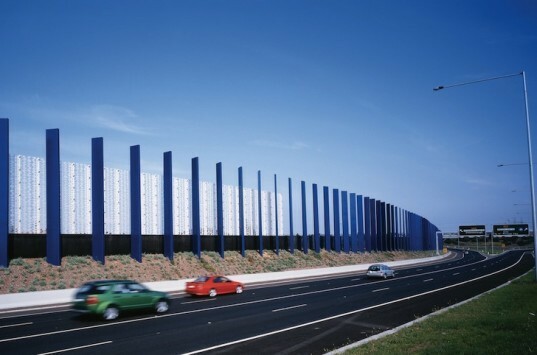 The award-winning design consists of three long sculptural sound walls punctuated by a pedestrian bridge and a Corten steel arc that sweeps across the freeway and creates a grand visual gateway into northern Melbourne. Designed to be experienced at high speeds of 110 kilometers per hour, the site-specific sculptural sound walls use repetition, contrasting colors and undulating shapes to create a sense of dynamic movement. Three distinct styles of sound walls were created to evoke diverse reactions to the landscape. Up above, the suspended pedestrian walkway, which is a dramatic and tilting Corten steel arc, doubles as a gateway that frames the first glimpse of Melbourne on the distant horizon. The first set of sculptural sound walls is composed of an undulating wave plated with Corten steel shaped into simple concave and convex folds. The rust-hued colors reference the earthen surroundings and imbue warmth into the freeway landscape. In contrast to the first, the second set of sound walls exchanges red hues for a series of repeating blue blades set in front of a long translucent, edge-lit acrylic wall sandblasted with a digital pattern. The final and third series of walls employ gabions and heavily planted earth berms for a more naturalistic style. Installed in phases, the final design was completed in late 2005. Designed to be experienced at high speeds of 110 kilometers per hour, the site-specific sculptural sound walls use repetition, contrasting colors and undulating shapes to create a sense of dynamic movement. The first set of sculptural sound walls is composed of an undulating wave plated with Corten steel shaped into simple concave and convex folds. In contrast to the first, the second set of sound walls exchanges red hues for a series of repeating blue blades set in front of a long translucent, edge-lit acrylic wall sandblasted with a digital pattern. The rust-hued colors reference the earthen surroundings and imbue warmth into the freeway landscape. Up above, the suspended pedestrian walkway, which is a dramatic and tilting Corten steel arc, doubles as a gateway that frames the first glimpse of Melbourne on the distant horizon. This is the underside of the dramatic suspended pedestrian walkway. A view across the freeway from atop the pedestrian walkway. The edges of the acrylic sound wall light up at night. Three distinct styles of sound walls were created to evoke diverse reactions to the landscape.